The themed maze at Stoughton Farm covers nearly eight acres. camera (Courtesy Tom Stoughton) Stoughton Farm in Newark Valley, New York, created an eight-acre Super Mario Bros. corn maze. 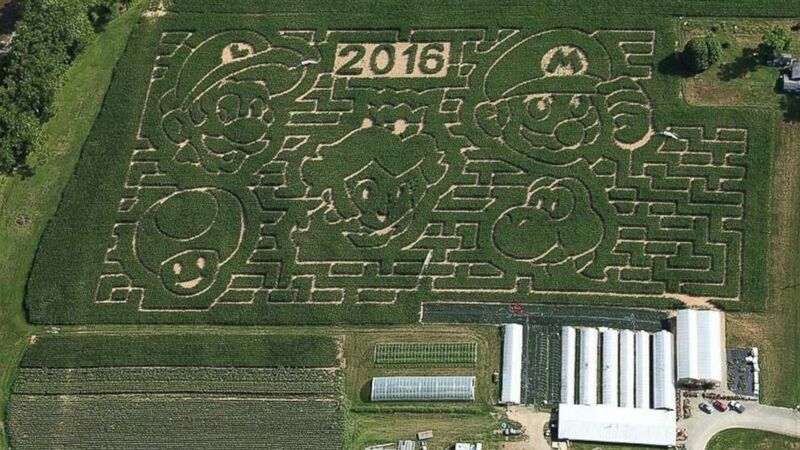 A New York farm is bringing the 80s back with a super-sized corn maze featuring Mario and Luigi from the Super Marios Bros. video game. The maze covers nearly eight acres at Stoughton Farm in Newark Valley, New York. Every year, since 2005, the farm has featured a different corn maze theme. "My wife, Deb, decides the theme," Tim Stoughton told ABC News. "She just liked the idea of the Mario brothers because everybody pretty much knows what they are and it’d be fun for the kids to see." The farm’s corn maze typically attracts about 10,000 visitors per year, according to Stoughton. This year’s maze was designed by a company in Utah and then created by Stoughton and his employees. "We lay it out into grids and then go in and take the corn out where the pathways should be," said Stoughton. "We do it when you can still see over the corn, before it gets too tall." Creating the maze usually takes a few weeks, Stoughton added. "It’s a lot of math," he said. "It’s laying it out in grids and seeing where you are." A pilot, who is also a friend of the farmers, took an aerial photo of this year’s maze that was posted on Reddit by Mike Weinmann, who works nearby. The post has nearly 2,000 comments. Stoughton said he and his wife were inspired to start the maze tradition 12 years ago as a way to draw attention to their family-run farm, which sells produce and other goods, in addition to running the maze and other activities to help with farm expenses. "We wanted something big to do, to keep us profitable and keep the place running," he said.